Artist, founding member of the Simon van der Stel Foundation and a trustee and life president of the Friends of the Johannesburg Art Gallery. Thelma Gutsche was born in 1915 in Somerset West, Cape Province to Dr. And Mrs. J Gutsche. Gutsche did not attend formal schooling but received private tutoring at home. She matriculated at the age of 14 in 1929. Two years later Gutsche enrolled at the University of Cape Town (UCT) to study for a Bachelor of Arts (B.A.) in Ethics, Logic, Philosophy and Psychology. After graduating she went on to complete her Master of Arts (M.A.) in Ethics, Logic and Metaphysics. 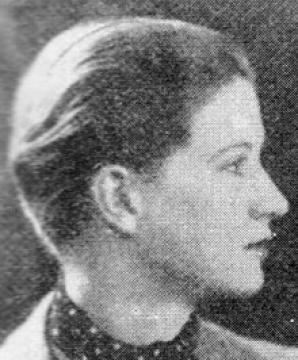 After completing her studies, Gutsche moved to Johannesburg where she began working for the weekly newspaper The Forum writing film reviews. She worked for The Forum from 1938 to 1939. Between 1937 and 1950 Gutsche also wrote a series of articles on the South African film industry for the Cape Times. While living in Johannesburg, Gutsche enrolled for a Doctoral Degree in Social History at UCT. Her doctoral thesis on The History and Social Significance of Motion Pictures in South Africa 1895 - 1940 was completed in 1946 and reflected her love for the film industry. During World War II, Gutsche was hired by the South African government as a film advisor to write scripts for documentaries and direct films. After the war, she continued to work in the film industry producing a number of education films. In March 1956, Gutsche became a member of the Africana Museum Advisory Committee. Around the same time she also served as a founding member, trustee and life president of the Association of Friends of the Johannesburg Art Gallery. Gutsche was also the founding member of the Simon van der Stel Foundation, a non-profit organisation that was established in April 1959 and sought to conserve and restore buildings of historical and architectural importance. In 1966, Gutsche received the Central News Agency’s prize for her book No ordinary woman: The life and times of Florence Phillips (1966). In 1972 Gutsche’s doctoral thesis was published as a book, The History and Social Significance of Motion Pictures in South Africa 1895 – 1940. This book contains archival, social and cultural research on the history of film in South Africa. It does not only look at South African film, but also at international film and the influence and effect of these films on South Africa and on society. From 1968 until 1981, Gutsche served on the Consultative Committee of the Bensusan Museum of Photography. She was an active member of the National Council of Women in South Africa and served as its president. Furthermore, Gutsche published a number of books on various subjects. After her retirement, Gutsche returned from the Transvaal to live in the Cape village of Montagu. Gutsche died of emphysema on 5 November 1984 at the age of 69. The History and Social Significance of Motion Pictures in South Africa 1895 - 1940 (1972). The Dictionary of South African Biography. The Standard Encyclopaedia of South Africa.